Founder of TwitPic Noah Everett has tweeted as "Getting arrested...in the back of a cop car now"
And, he had tweeted below photo as proof. Noah Everett is having more than 2.7 million Twitter followers. Right now, the reason for his arrest is unknown. If you know any more details you can share it thro' the comments. His latest tweet is "...I guess you can't walk down your own street half naked...who knew - I got a free ride home by the nice police officer"
TwitPic is a website which allows Twitter users to easily post pictures to the Twitter. 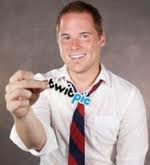 TwitPic is often used by citizen journalists to upload and distribute pictures in near real-time as an event is taking place. You can see the LinkedIn profile of Noah Everett here. Photos can be uploaded to TwitPic easily from various smart phones. TweetDeck, Echofon, Tweetie, Twitfile, and Twitterrific are iPhone applications for uploading photos from iPhones to TwitPic. And, Android phones can upload pictures to TwitPic with the Twidroid and Seesmic applications.